Harley recovered from torn ACL. Read his success story.Torn Tendon Solution contains a group of herbs that work together to literally repair torn (ruptured) tendons and ligaments. With the direction and support of these herbs, the torn fibers actually reconnect and rebuild a strong healthy tendon. Fiber tearing is a more serious injury than a strain or sprain. It occurs suddenly and the degree of swelling, heat and lameness is often, but not always, more than that of a pulled tendon. The Cranial Cruciate Ligament (CCL) which connects the bones of the knee, is the most commonly torn ligament in dogs. 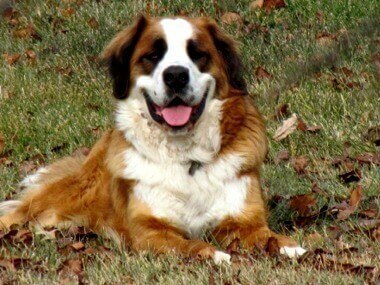 This is especially true for larger breeds due to the ligament having to support more weight. Damage to the CCL is often associated with rear leg lameness in dogs and is a major cause of degenerative joint disease in the stifle joint. In order to definitively diagnose a torn tendon, ultrasonic imaging is needed. Torn Tendon Solution repairs torn and separated fibers, reduces the damaging inflammation, and prevents the formation of adhesions. Circulation is especially important during the healing process in order for nutrients and oxygen to reach the injury site. To insure that the tendon gets this needed circulation, Dr. Thomas included a potent group of herbs that increase circulation to the affected tendon and/or ligament in the Torn Tendon Solution formula. Ingredients: wu jia pi, ru xiang within a proprietary blend. 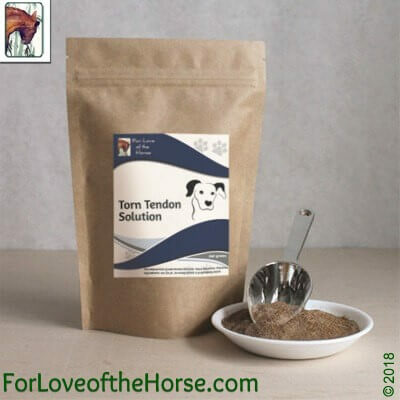 Torn Tendon Solution for Dogs 360g Discounts Apply !